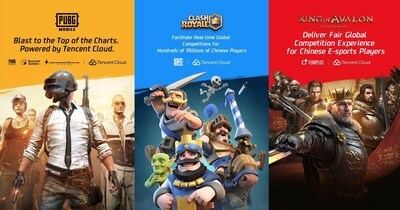 SAN FRANCISCO, March 21, 2019 — (PRNewswire) — Tencent Cloud showcased its leading suite of cloud solutions at the 2019 Game Developers Conference (GDC) from March 20 to 22 in San Francisco. The company specializes in supporting cutting-edge, feature-rich performance for cross-border real-time multiplayer gaming, both for Tencent-developed games and other major global titles and developers. Tencent's cloud ecosystem supports games across their full life cycle. In addition to a proven cloud infrastructure and mature gaming solutions such as Tencent Cloud's Global Application Acceleration Platform (GAAP) and Game Multimedia Engine (GME) that facilitate sophisticated game development and operation, Tencent's combined cloud, gaming and channel resources mean it offers unique benefits for game distribution and operation, removing the barriers for developers around the globe to succeed in the Chinese market. Tencent Cloud is a leading global cloud services provider, and the first in China to be certified by Cloud Infrastructure Services Providers in Europe (CISPE). Its global infrastructure covers 25 regions and operates 53 availability zones in the world with high-speed interconnection. With 5T bandwidth and Tencent Anti-DDoS, gamers are ensured a high-quality, stable and secure gaming experience. For large-scale cross-border multiplayer gaming scenarios, Tencent Cloud's GAAP ensures a smooth and fair gaming experience by using acceleration tunnels to reduce latency between major regions. GAAP has contributed to the success of numerous global hits by giving gamers from different countries and regions the opportunity to compete with each other in real time, making new regional markets accessible to game developers. Supercell's Clash Royale became an instant hit in the Chinese market when it was released in March 2016. The GAAP solution cut latency to under 150 ms for players in China accessing US-hosted games, bringing error rates in the region down to a comparable level with the US local network environment. In this way, the game's millions of active players were provided with a smooth, fair gaming experience on a par with their US counterparts. According to Newzoo, 21.5% of the game's total iOS revenue in the first month of its release came from China, the second biggest revenue source after the US. For PUBG Mobile, which is jointly launched by Tencent and PUBG Corp, GAAP improves cross-region connection, and by solving network problems including latency and instability, guarantees global concurrent connection. PUBG Mobile topped mobile game charts in 105 countries and regions one week after global beta launch. It was voted Mobile Game of the Year in the 2018 Joystick Awards and currently has over 200 million downloads. Tencent's King of Glory, the world's second-highest-grossing free-to-play game in 2018 with a revenue of US$2.1 billion, uses GAAP to better serve users outside of China and results in a 30% decrease in packet loss rate in some areas. Funplus's King of Avalon is another well-known title that utilizes the GAAP solution to ensure an optimal experience for global players. Tencent Cloud's GME provides features such as in-game voice chat, voice messaging, voice-to-text conversion and 3D positional voice chat. Leveraging cutting-edge head-related transfer function (HRTF) technology, spatial processing and EQ compensation for distance, 3D positional voice virtualizes players' voices and renders them as 3D sounds, meaning that players hear each other's voices as if they are originating from their relative position in the game. Such features provide a more immersive and realistic experience and constitute a crucial gameplay element in cooperative multiplayer games, like King of Glory and its international version Arena of Valor, which also benefits by game voice services of Tencent. GME supports all mainstream game engines, including Unreal and Unity. For proprietary game engines, GME can also be offered as a core SDK with unified APIs and feature sets. Integration is quick and simple, typically taking no more than a few hours. GME is a scalable, high-quality and cost-efficient voice communication service that helps gamers connect with each other more effectively around the globe.